What's My Chance Of Having A Baby? A Better Predictor Of IVF Success : Shots - Health News Achieving pregnancy with in vitro fertilization depends largely on your age. But other factors contribute, too. A study compares two online tools aimed at giving couples a realistic sense of the odds. In the technique known as intracytoplasmic sperm injection, a fertility specialist uses a tiny needle to inject sperm into an egg cell. There are several tools online that can run the numbers for couples, in an attempt to come up with a tailored probability of success. These tools use information such as a woman's age — the most important factor — as well as pregnancy history and infertility. Now scientists in the United Kingdom say a newer prediction tool, called IVFpredict, is more accurate than an older, established one. They describe the comparison Wednesday in the online journal PLOS ONE. The widely used Templeton model was derived from data from two decades ago, when success rates for IVF were lower. IVFpredict is based on more recent data. And it reflects the use of intracytoplasmic sperm injection, or ICSI, a technique in which a technician uses a needle to insert sperm into the egg. ICSI can improve IVF outcomes when there's a problem with the sperm. The IVFpredict tool also asks for the woman's age, how long she's been trying to conceive, whether she plans to use her own eggs or a donor's, the cause of infertility, previous history of pregnancy and IVF attempts, and which drugs will be used. Both online tools were developed using data from the U.K. When tested with a new batch of IVF data from the U.K., the IVFpredict model gave a more accurate prognosis in 52.5 percent of cases, says Andrew Smith, a medical statistician at the University of Bristol, who contributed to the study. Both tools underestimated the chance of live births — IVFpredict to a lesser degree. But Dr. Jim Toner, president of the Society for Assisted Reproductive Technology, says Americans are likely to get a more accurate prediction if they use a model based on data from clinics in the United States. That's because treatment protocols and success rates vary from country to country. 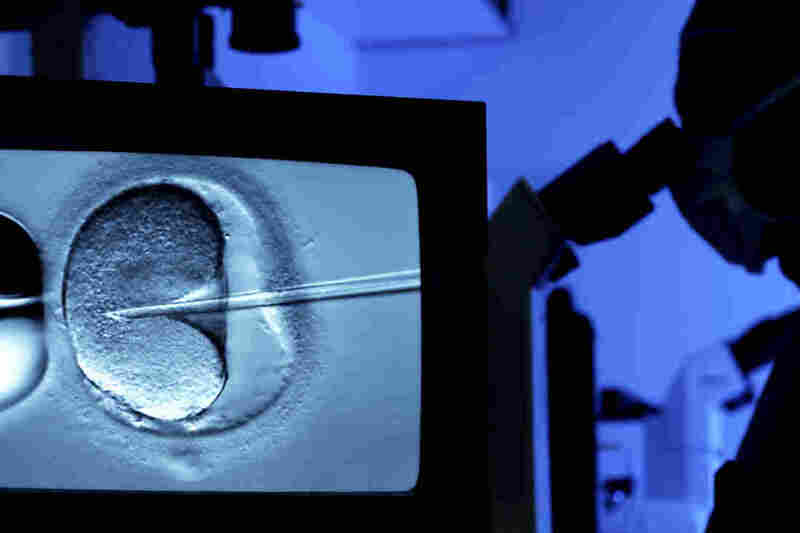 IVF is booming in the U.S., with 1.5 percent of births in 2012 conceived through the therapy. 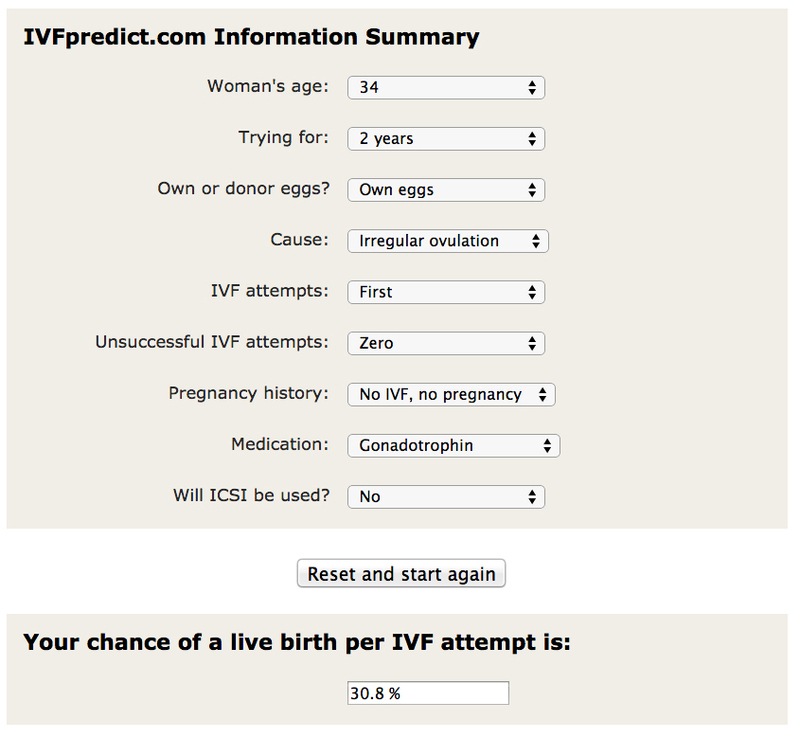 As it happens, SART launched its own prediction tool in January, based on almost 500,000 IVF cycles among 320,000 women. The tool asks for information similar to that requested by IVFpredict: a woman's age, number of prior pregnancies and births, fertility diagnosis, source of the eggs. But it also asks for a woman's height and weight because some studies suggest obesity can make IVF treatment less effective. The U.S. model, Toner says, would very likely predict a greater chance of success than the U.K. version. My own experiment testing both tools for the purposes of this story bore that out: The IVFpredict model estimated a 5 percent chance of a live birth per IVF attempt, while the SART Patient Predictor estimated a 14 percent chance. That SART tool also gave me an estimate of how my odds would change if two embryos were implanted at once — a 21 percent chance of a having a single child, and a 15 percent chance I'd have multiple children. Both models are simple enough for patients to use by themselves — they don't ask for much technical information. In the future, Toner says, the SART model will be able to incorporate the results of lab tests run before IVF starts. SART also publishes individual success rates for each registered clinic in the United States. Rates can vary considerably across practices. But Smith says picking a clinic is a separate decision for couples or individuals to make, after they've figured out whether they're willing to play the odds with IVF at all. "We want couples to have a realistic expectation [of their chances]," Smith says.